What tamed the Rock Island Rapids? | River Action, Inc.
What tamed the Rock Island Rapids? CLICK HERE to find out what tamed the Rock Island Rapids? Looking out across the water, it's hard to imagine a river once so shallow navigation was almost impossible. In the early days of steamboating, the Upper Mississippi River was feared by many riverboat captains. The shifting sandbars and shallow waters were sure to make any trip a challenge. The Rock Island Rapids, which stretched 14 miles from LeClaire, Iowa to Rock Island, Illinois was known to be one of the toughest areas of them all. 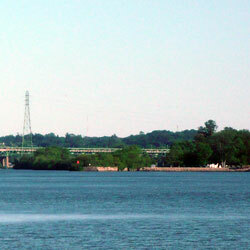 In 1907, in an attempt to tame this section of the river, the Moline lock was built on the north east side of Arsenal Island. If you look across the river to the Illinois side you can still see what remains of this lock today. This lock was built on the downstream end of a long man-made wall. This wall divided the river and created a deeper channel for boats to pass around the rapids rather than having to pass through them. The lock was only 325 feet long and 80 feet wide, but it had a depth of 6 feet which was what the steamboats needed. In the early 1930’s, the Moline lock and steamboat canal were abandoned with the construction of the existing lock and dam system, built by the U.S. Army Corps of Engineers, to maintaina 9-foot depth year round. This system backed up the water to the minimum 9-foot depth, making navigation possible outside of the canal. Since the lock and canal were no longer needed, the lock gates were removed and the canal area became an open passageway used mostly by recreational boats today.